Osteoarticular Regenerator, Chondrogenesis and Antiarthrosis Promoter. Chondroitin Sulfate / Glucosamine Sulfate via injection. 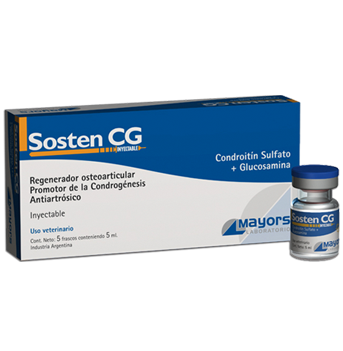 Chondroitin sulfate and glucosamine are drugs of choice because they are capable of supporting or promoting the metabolic activity of chondrocytes while inhibiting the degradative action of mediators (cytokines or prostaglandins) or enzymes (proteases) on articular cartilage. These drugs control the inflammation and biosynthesis of macromolecules in other connective tissues such as synovial membranes, ligaments and tendons. VIA INJECTABLE SUBCUTANEOUS or INTRAMUSCULAR. 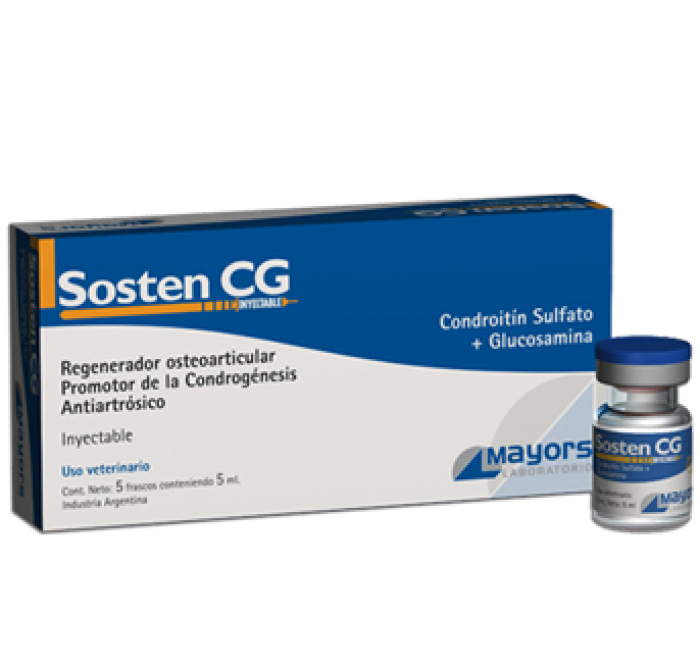 - Coadjuvant in the treatment of general or localized osteoarthritis, osteoarticular degenerative pathology - (osteoarthrosis). - Remodeling of structures deformed by osteodistróficos processes during the growth and development. - Repair processes of ligaments and tendons, bone and cartilage fractures. 5 ml as an average dose for animals of 400 kg. One application every 5 days. In acute cases: a daily dose for 8 days, then continued every 5 days, until symptom remission, approximately for 60 days. The time of administration depends on the degree of osteoarthritis, the intensity of the factors that determine secondary osteoarthritis, and the individual response capacity.